Did you know we offer 18" Inspiration Bowls to help merchandise component plants? The bowl below contains Kwik Kombos™ Fire & Ice Mix (Petunia Whispers Red, Bidens Mexican Gold, and Lobelia Techno Heat Light), which is part of our 1-gallon All in One program. Below is a peek at some of the products we'll be shipping next week. The slideshow may take a minute to load. Colorful caladiums are long-time favorites for planting under trees and in other deeply shaded areas, and now they can now be enjoyed almost anywhere in the garden. New sun-tolerant varieties perform well in the landscape, especially as a border or as a backdrop for shorter garden annuals. 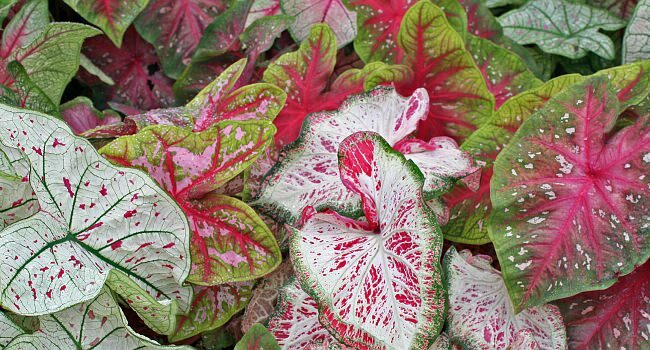 Caladiums also provide texture, height and color in mixed containers – just be sure to pair them with plants that have similar light and water requirements. Sunbelt's caladium program includes both sun and shade varieties in quart 8-packs as well as larger landscape varieties in 6.5" pots. POP is available, and we have a video for more information. Choosing plants for mixed containers is easy with the "one and done" philosophy behind Kwik Kombos™. Particularly useful for larger patio pots or hanging baskets, each Kwik Kombos 3-in-1 plant recipe is designed to provide a fully balanced and strikingly beautiful finished container with exceptional outdoor performance. Our Kwik Kombos are available in 1-gallon pots and 11" hanging baskets. Combinations include three calibrachoa Callie® mixes: Citrus Fire™, Pink Bliss™ and Pure Joy™. Other mixes include Pink Vibrations™, Cascading Waterfall™, Fire & Ice™ and Night in Pompeii™. POP is a available as well as our video. The unique, spiky blooms of Celosia Intenz add a tremendous pop of color in landscape beds, especially when clustered in groups of 3 to 5 plants. Reaching a height of 15-18 inches with a spread of approximately 12 inches, Intenz also works well as a “thriller" in mixed containers. Intenz blooms throughout summer and tolerates cooler weather in fall. It’s easy to grow and low maintenance, requiring little to no deadheading. Full sun exposure encourages the most vivid bloom color. 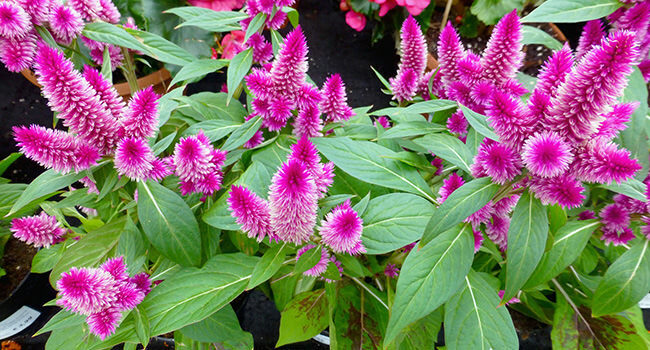 Sunbelt produces Celosia Intenz in 1-gallon Plants that Work® 6-packs. POP is available in addition to our video.